Once you learn how to make sauces you can dress up casseroles, use them to top your pasta and even stir them into vegetables. There are several different types of sauces we will cover on this online cooking lesson such as cream sauces, alfredo sauces, tomato sauces and teach you what the 5 mother sauces are. The 5 mother sauces originated from Antonin Careme who categorized four main sauces being Bechamel, Veloute, Brown and Tomato. In the 19th century, Chef Auguste Escoffier added Hollandaise. There are a few variations and different ingredients used in different recipes but all recipes derive from one of these 5 basic sauces. Bechamel is a white sauce made from a roux. 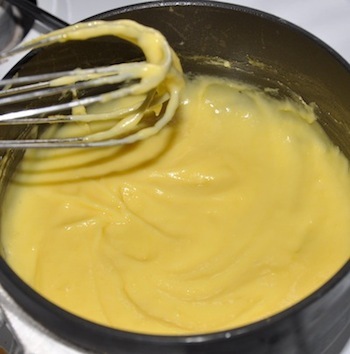 A roux is a combo of flour and usually butter or oil. You simmer the combination and add in milk. Milk thickens with the roux. You add your seasonings and it becomes a delicious sauce. A mornay sauce comes from bechamel. Mornay is when you add cheese to the bechamel and is what you would find in a homemade macaroni and cheese sauce. 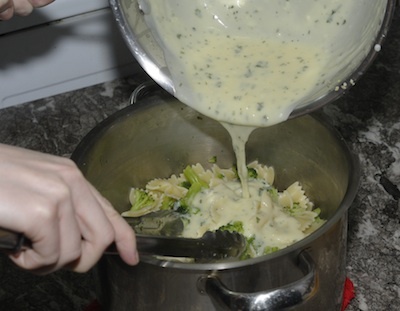 Try these recipes to learn how to make bechamel sauce. Try Alfredo or white sauce on pizza in place of tomato sauce. Stir homemade sauce in cooked mixed vegetables. Add sauce to any shape pasta noodles. Use sauce for dipping chicken strips. Substitute Alfredo with tomato sauce in lasagna. Veloute is also known as the blond sauce. It is similar to the Bechamel sauce except instead of adding milk to your roux you add stock. You can add cream to thicken the sauce. 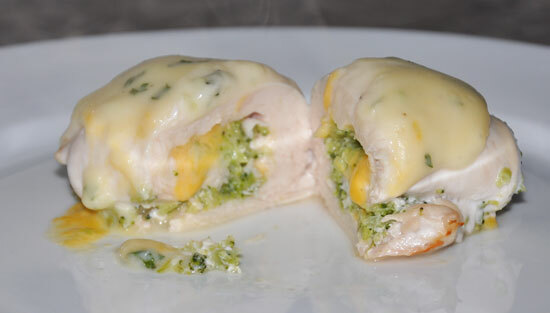 Try this recipe using a veloute sauce, Broccoli, stuffed chicken with Veloute sauce. 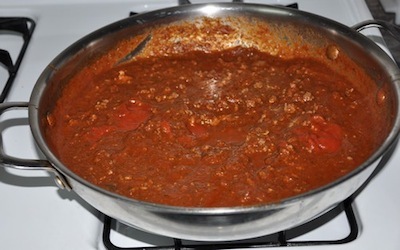 This famous red sauce is one of the more popular Mother sauces. This type is based from tomatoes with added seasonings, flavors and liquid. Learn how to make tomato sauce with these recipes. This brown or demi-glace sauce is traditionally made from beef stock and sometimes, tomato paste. It is usually always served with meat. You make brown sauce by adding beef stock to your roux. It is different then cooking roux in a Bechamel in that it is cooked for a long period of time. It also becomes brown in color and resembles what we would call a gravy. 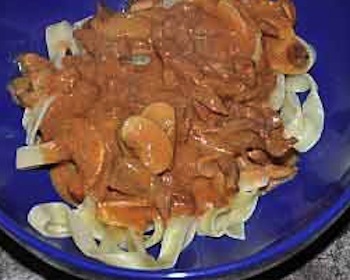 This is not a typical brown sauce but is a quick version, Beef Stroganoff recipe. 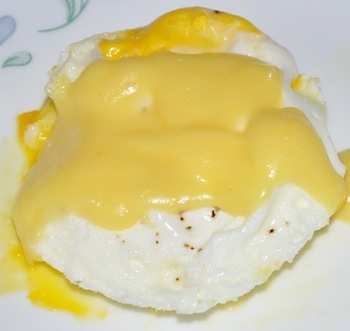 Hollandaise is made from butter and egg yolks. Dishes you'll find this sauce in are Eggs Benedict, over vegetables meat or fish. It is a clear or yellowish sauce. In a saucepan, melt butter and add flour. Blend together making a roux. Slowly whisk in milk until smooth. Take off heat and allow to cool 3-5 minutes. Add egg yolks and mustard. Stir until well blended and eggs have warmed in the heat of the warm sauce. Blend in the lemon juice and salt. Serve. 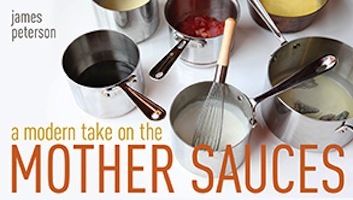 Learn how to make homemade sauces such as barbecue sauce, teriyaki sauce, peanut sauce and more homemade sauce recipes. Share a recipe on how to make sauces or what you do with your homemade sauces.